Bardet–Biedl syndrome (BBS) is a rare ciliopathic genetic disorder that affects many systems of the body. This syndrome is pleiotropic with variable expressivity. The signs and symptoms of this condition vary even among the affected members of the same family. Loss of vision is one of the major features of this syndrome. Due to cone-rod dystrophy, people will have progressive visual impairment. It occurs as the retina gradually deteriorates. The visual prognosis for children is poor and the problem with night vision become apparent by mid-childhood. Mutations in several genes are known to cause this syndrome, which shows autosomal recessive pattern of inheritance. Rarely, digenic/oligogenic inheritance has also been reported. 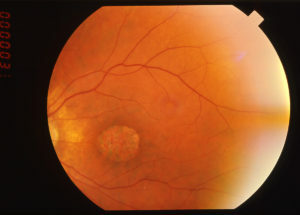 Bardet-Biedl syndrome is usually characterized by retinitis pigmentosa, kidney dysfunction, polydactyly, behavioral dysfunction, and hypogonadism. In this syndrome renal abnormalities appear to have a high frequency, which is also the main cause of morbidity and mortality, along with male hypogenitalism and female genitourinary malformations. Auditory deficiencies: Conductive hearing loss due to glue ear is common in children. A subclinical sensorineural hearing is developed by almost half of the adults. Truncal obesity: Fat is disproportionately distributed on the abdomen and chest rather than the arms and legs. Speech delay: Affected children may have a nasal, high-pitched voice, associatd with usually poor articulation. Ataxia: Many affected individuals show an impaired ability to coordinate voluntary movements, resulting in a certain degree of clumsiness and abnormal gait. Diabetes mellitus : Diabetes mellitus tends to become evident in adolescence or adulthood. Cataracts/astigmatism: Ocular findings may occur like clouding of the lens of the eye; damage to the optic nerve often associated with increased intraocular pressure. Brachydactyly/syndactyly: Fingers and toes of both the hands and feet may be abnormally short, which is common (brachydactyly/syndactyly occurs in approximately 70% of cases). Webbing of the fingers or toes may also occur and the feet may be short, wide and flat, with no arch. Rarely, other similar abnormalities such as clinodactyly may occur. Anosmia: The inability to perceive odor or the loss of the sense of smell may be found, although rarely. Anosmia may be temporary, but sometimes can be permanent. Developmental delay: Many children with Bardet-Biedl syndrome are delayed in reaching major developmental milestones including gross motor skills, fine motor skills, and psychosocial skills. Mild hypertonia: Mild hypertonia of especially lower limbs can be seen, sometimes affecting all four limbs. Cardiovascular anomalies: 50% of individuals with Bardet-Biedl syndrome reveal cardiac abnormalities. Congenital heart disease in approximately 7% of affected individuals. The most commonly reported lesions are Valvular stenoses and atrial/ventricular septal defects. Craniofacial dysmorphism: Include brachycephaly, macrocephaly, narrow forehead, male frontal balding, large ears, short and narrow palpebral fissures, depressed nasal bridge, relative upward displacement of the nose and upper lip, midface retrusion etc. Behavioral abnormalities: Behavioral abnormalities are evident in about 33% which include emotional immaturity, outbursts, lack of social dominance, disinhibition, obsessive compulsive behavior, and depression. Bardet-Biedl syndrome affects males and females in equal numbers. The prevalence is estimated to be between 1:100,000 and 1:160,000 in Europe and America. The disorder occurs with greater frequency in the Bedouin population of Kuwait (1 in 13,500) and in certain populations of Newfoundland (1 in 17,500). The disorder was first described by Dr Bardet and Dr Biedl in the 1920s. The disorder is clinically and genetically heterogeneous, shows autosomal recessive inheritance and it is highly prevalent in inbred/consanguineous populations. Occasionally digenic/oligogenic inheritance has also been reported. Bardet-Biedl syndrome occurs as a result of defect in genes that codes for many ciliary-related proteins, as it arises due to ciliary dysgenesis and dysfunction. Therefore Bardet-Biedl syndrome is grouped as a ciliopathic disorder. Cilia are involved in cell movement and many different chemical signaling pathways and are also necessary for the perception of sensory input. About 25% of all cases of Bardet-Biedl syndrome result from mutations in the BBS1 gene. Another 20% of cases are caused by mutations in the BBS10 gene. The other genes each account for only a small percentage of all cases. ALMS1, ARL6, BBS1, BBS10, BBS12, BBS2, BBS4, BBS5, BBS7, BBS9, C8orf37, CCDC28B, CEP290, LZTFL1, MKKS, MKS1, SDCCAG8, TRIM32, TTC8, WDPCP. Mutations in CCDC28B, MKS1, MKS3, and WDPCP may also act as modifier genes when having variants which impact the expression of Bardet-Biedl phenotypes in patients who have causative mutations in other genes. Mutations in the following additional genes have been reported in isolated cases and therefore need to be confirmed as causative genes: BBIP1 and IFT27. Laurence-Moon syndrome: affected individuals have no polydactyly but have a spastic paraparesis. Cohen syndrome: it is a genetic disorder involving developmental delay, microcephaly, intellectual disability, retinal dystrophy, and progressive myopia. Alström syndrome: it is a genetic condition featuring obesity, paediatric cone-rod dystrophy, and deafness. McKusick-Kaufman syndrome: patients have congenital heart disease, polydactyly, and fluid in the pelvis. Meckel syndrome: also known as Meckel-Gruber syndrome, it is a rare genetic disorder characterized by abnormalities affecting several organ systems. Characteristic findings include meninges through a defect in the back or front of the skull (encephalocele), polydactyly, and polycystic kidney disease. Biemond II syndrome: this is a very rare genetic disorder characterized by absence of tissue from the colored portion of the eye (iris coloboma), obesity, mental retardation, genitourinary abnormalities, and postaxial polydactyly. Prader-Willi syndrome: the syndrome is characterized by hypotonia, feeding difficulties, and failure to grow. Cognitive impairment is constant. Obsessive behavior and skin picking can be present. Joubert syndrome: this syndrome shows consistent clinical overlap with Meckel syndrome. Indeed, more than genes have been associated to Joubert syndrome, of which 13 are associated to Meckel syndrome. The Joubert/Meckel-Gruber syndrome genes are: AHI1, ARL13B, B9D1, B9D2, C5orf42, CC2D2A, CEP104, CEP290, CEP41, CSPP1, INPP5E, KIAA0556, KIAA0586, KIF7, MKS1, NPHP1, NPHP3, OFD1, PDE6D, RPGRIP1L, TCTN1, TCTN2, TMEM138, TMEM216, TMEM231, TMEM237, TMEM67, TTC21B, and ZNF423. Senior-Løken syndrome: phenotypic overlap with Joubert syndrome and Bardet-Biedl syndrome is common. Mutations have been found in the CEP290 , NPHP1, NPHP3, NPHP4 , IQCB1 , and SDCCAG8 gene. Leber congenital amaurosis: LCA is a severe dystrophy of the retina, which typically becomes evident in the first year of life. LCA genes are AIPL1, CABP4, CEP290, CRB1, CRX, GDF6, GUCY2D, IMPDH1, IQCB1, KCNJ13 , LCA5, LRAT, NMNAT1, OTX2, PRPH2, RD3, RDH12, RPE65, RPGRIP1, SPATA7, and TULP1. Genetic heterogeneity complicates clinical testing and is critical for early diagnosis, carrier testing and prenatal analysis. Considering the high level of complexity in the molecular cause of Bardet-Biedl syndrome, which may aso show oligogenic inheritance, it is highly recommended to test patients by a multigene panel, possibly based on exome or full genome sequencing.